I LOVE Muddy Buddies….Puppy Chow….or whatever you like to call them! I also love fun spins on a great snack food! If you haven’t checked out Nutella Puppy Chow be sure and do so! It is AMAZING! Well, today I have another one for you!….I don’t know why, but I have a seriously obsession with all things “cake batter”. Something about the flavor gets me craving it ALL THE TIME! 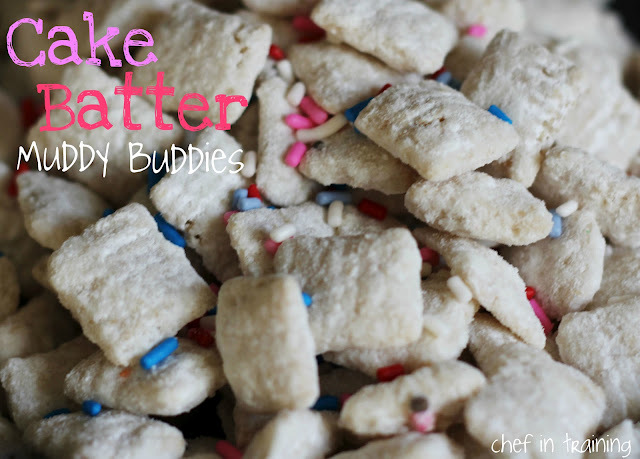 When I saw the recipe for Cake Batter Muddy Buddies (also known as Puppy Chow) over at So Very Blessed, I had to make it IMMEDIATELY! It is seriously so easy to whip up and has the sweet cake batter flavor that we love! Pour 5 cups of Chex Cereal into a large bowl and set aside. In a large bag, put cake mix and powdered sugar and shake to mix evenly. Melt chocolate/almond bark in 30 second intervals, stirring in between each interval. If needed, add a little bit of vegetable shortening to thin and smooth. Pour Chocolate/Almond Bark over cereal, stirring and folding until the cereal is completely covered. Stir in some sprinkles if you would like. Pour the Almond Bark covered cereal into the large bag with the cake mix/powdered sugar mix. Zip up the bag and shake until all the cereal is coated with the powdered mixture. Yum! Definitely going to try this soon!! Oh my gosh- so funny! I made these too and am posting them tomorrow! They are seriously divine, huh? I ate WAY WAY too much. The cake batter flavor is so good. :) Have a good weekend! I like this variation. I havent seen this one before although we have made **Puppy Chow** in the past. I think I have a weekend sweet project.... =) Just need Chex. I saw this on Pinterest the other day and I was waiting to see you make it!! Ha Ha - I love cake batter too. Are those extra sprinkles added in just for the picture, or did you serve them that way? I added them in for the picture, but you could definitely add them into the recipe too. If you do, I might recommend stirring some into the almond bark so that they stick to the chex cereal better. Otherwise, they will be loosely in the mix and not really get eaten. I pinned this last night. When I checked my emails this morning you would not believe how many people re-pined it. CRAZY! Now it's time to make it. ;) Renea. I love your picture! I know i can always count on Chef in Training for great recipies and pictures! You take wonderful pictures! So going to make this recipie tomorrow!! oh I LOOOVE this idea!! we LOVE puppy chow! !These sound delicious! !Thanks for linking up! I featured your post in my wrap up http://tidymom.net/2012/birthday-parties/Have a great rest of the weekend! J just made this and its delicious!! If I, correction, WHEN I make it again I'll probably do 1 1/4 cup cake mix and 1/4 cup powdered sugar. It just seemed like I had a lot of "powder" left over. Very good though. I used funfetti cake mix. Worked great! Muddy buddies are my son's favorite. He was just asking me to make him some. I'll have to give these a try this time! Thanks for the idea! These were delish! I used half rice and half corn chex, and used vanilla cake mix. I also mixed in some sprinkles to the sugar/cake mix to give it a little color. Great snack, thanks! Awesome! Finally something that doesn't contain peanuts!! More recipes like this please...you have no idea how difficult it is having a now 17 year old with life threatening allergies to nuts. Being in the room is all it takes.. Thank you for sharing this recipe. My husband has been leaving this page open on my laptop and begging me to make this. I gathered the ingredients while shopping today and truth be told dreaded having to bake or cook anything since it was my only day off in over a week. I took a look at the recipe and thought why not? It only took me 8 minutes start to finish to make these. They look perfect and taste great. I'll be making these I'm sure every day for a week and expected to now during holidays. Great share, my husband loves you for it.